He is bursting with confidence. 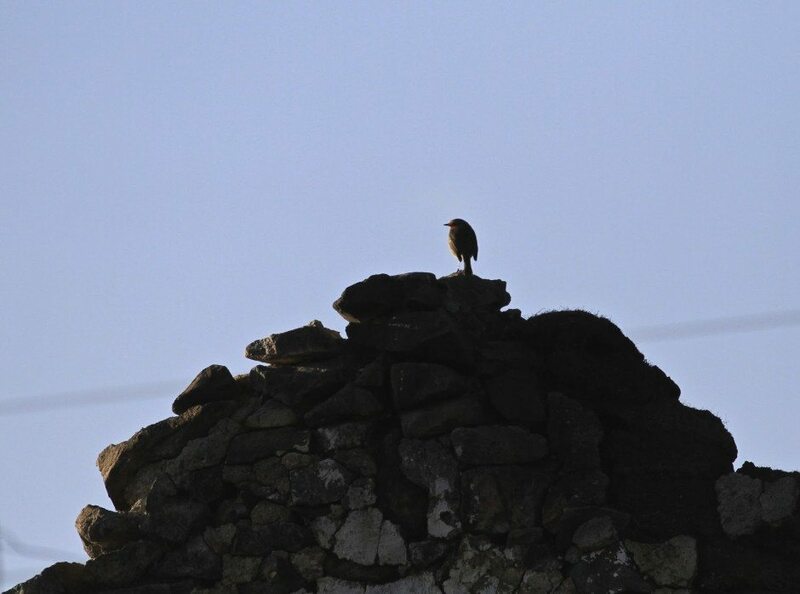 I am probably standing too close to his territory so there is an air show going on from the top of a pile of rubble to the rose tree in the farm yard. At one point he lands on the post in front of my nose. His face says…..YIKES and he takes off instantly. Robins are tiny but unstoppable. Sometimes here in my neighbours farm yard I perch the camera on the white washed wall and wait. 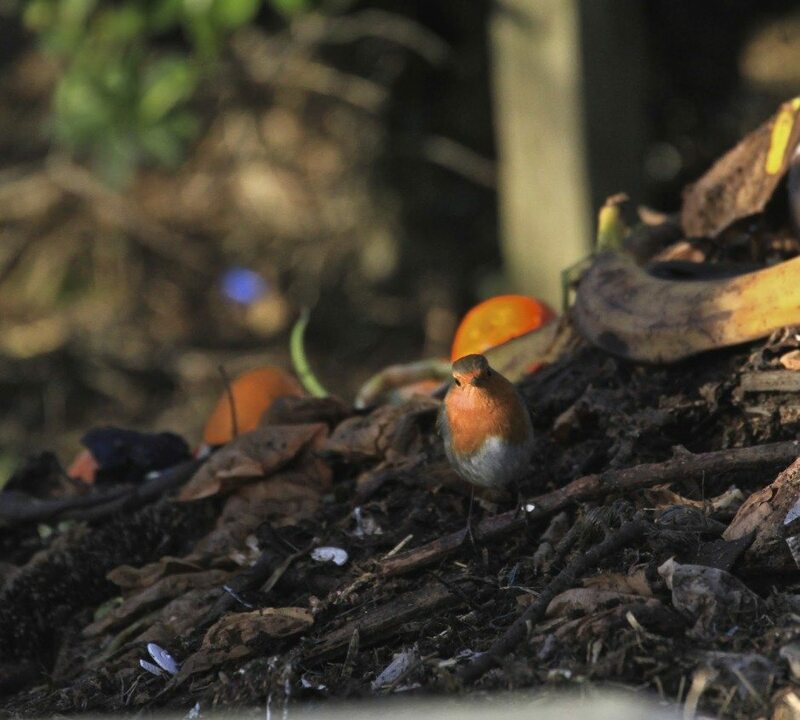 She has just emptied a bucket of orange and banana peels on top of the compost heap. This is one of the local birds’ favourite lunch spots. Standing there slows the ticking brain. Puts things in perspective. Opens the heart to priorities. It’s a kind of meditation. Another voice takes over, calming, soothing, slowing. It’s coming to the end of the year. What are the important questions now? What are the next steps? 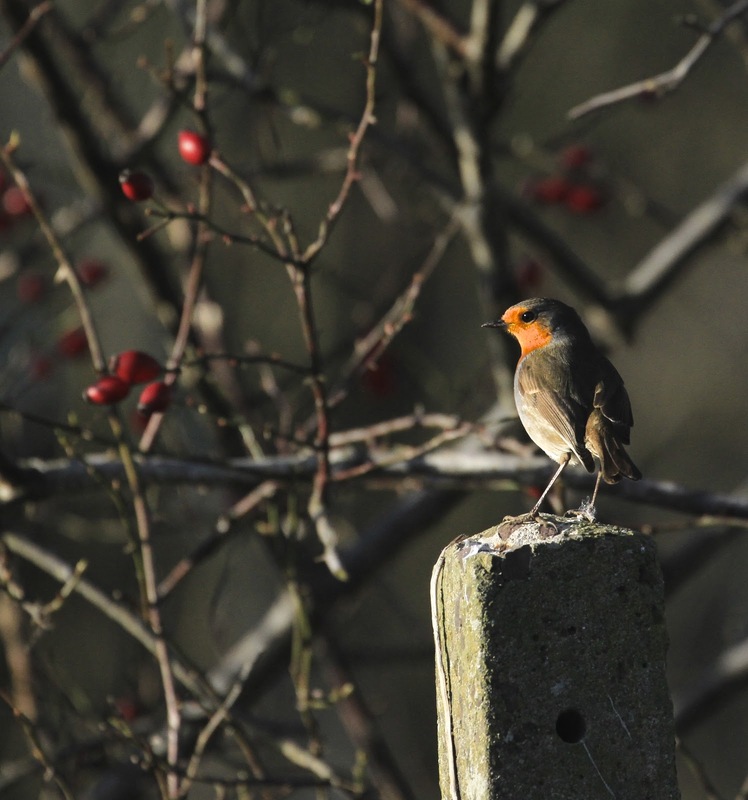 As the Robin comes closer and I stand beneath his soft breath, those old hat questions fade away into the cold morning air…..
Beautiful images, beautiful words. Your post are my meditation too. Thank you Carol, you have made my day! Thank you so much Marigold! Yes, I love that idea! I've always thought that writing is a type of meditation as well. O writing definitely. But for myself I think I might just try too hard when I'm writing whereas the lack of control when you are looking at birds really blanks the mind. Thank you Jill, must try less structured writing and get into that zone! Exactly! Had a similar experience yesterday afternoon in warm, December sunshine. You've expressed it perfectly. Thanks Cat, another light seeker! Love those balmy December days, it's a bit cold and windy here at the moment, not great for still photography…. I love watching the birds. Time just slips through my fingers when I watch them with a camera, which is much like meditation, I guess. Being outside calms my thoughts, whether it is gardening or taking photos. Sadly, I get way too cold this time of year to be outside much or take many outdoor photos. Thankfully, bird watching is something that we can enjoy indoors, even though the photos are never quite as clear. Yes Indie, me too! Very soon I will start to feed them closer to the house but then it's almost too easy! 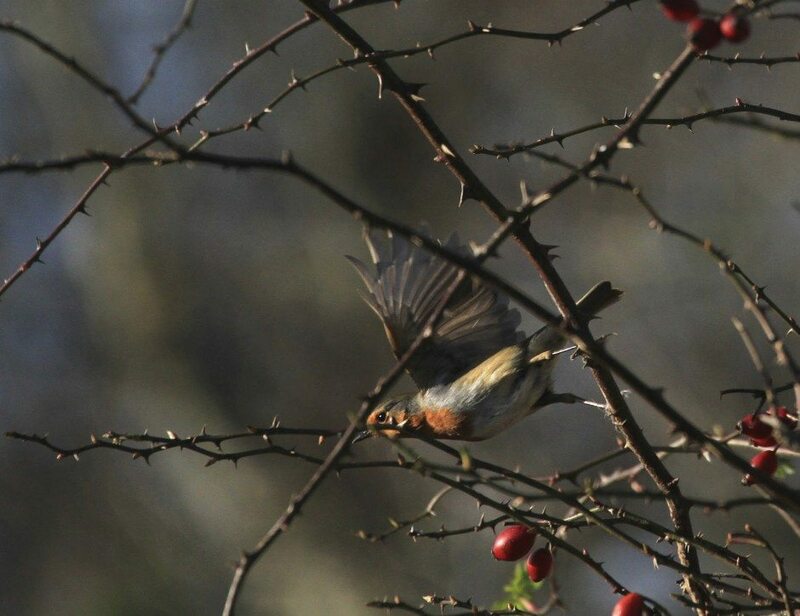 Just fabulous Catherine and I agree photography is meditative….we both seem to be focused on our robins and what they are showing us….I just did a post about one of my robins from this year too! Aha Donna, I'm popping straight over there to visit your robin! The meditation is especially soothing at this time of the year isn't it? Oh, I love your little Robin so! and I love the important questions that this time of year always bring. beautiful images my dear! Yes, it's that time of year…to think, contemplate…what is next? Lovely! Bautiful and deep images. Yes your photography opens to meditation. these are just beautiful. i'm in awe at your photos, as always!